The Nikon D3400 Digital SLR Camera has a 24.2MP sensor that captures pictures with amazing clarity. The 100-25600 ISO sensitivity is perfect for low-light shooting and fast moving subjects. Record family movies or dramatic films thanks to the 1080p Full HD capabilities. Use built-in bluetooth to pair your camera with your smartphone for easy sharing. Additional features: no optical low-pass filter, 3.0″ LCD, 11-point AF system, 5 FPS continuous shooting, plus more! 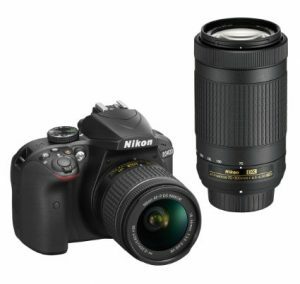 This outfit includes the AF-P DX NIKKOR 18-55mm f/3.5-5.6G VR and AF-P DX NIKKOR 70-300mm f/4.5-6.3G ED lenses.